Q: Why did you write Dangerous Instincts? Not recognizing those individuals who posed a real threat to them or their family. It wasn’t until I retired and found myself using what I’d learned in the FBI during my everyday life—when hiring people to come in and do work on my home, when offering clients advice on the decisions they were trying to make, when traveling overseas, or when consulting on both criminal and non-criminal cases—that I realized what I’d learned as a profiler could be very useful to others. That is what Dangerous Instincts is about. Q: What will people learn from Dangerous Instincts? 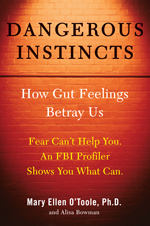 A: Dangerous Instincts teaches you how to look at your own behavior and the behavior of those around you. It shows you how to understand this behavior based on the analytical style I used as an FBI Profiler. While it is not likely you will ever interview a serial killer, a kidnapper, a bank robber or a politician who has taken thousands in bribes, the very same communication skills I successfully relied on while in the FBI can be applied to everyday life and make a big difference in the success of your interpersonal communication with your family, friends, colleagues and even strangers. I welcome you to come along for a journey that will help you improve your life and the lives of your loved ones. Q: How can someone without 30 years of experience really apply these techniques? A: The material in Dangerous Instincts is written so it is easy to understand and apply to situations we all encounter every day of our lives. Some of the methods I recommend will require practice. But with practice the techniques will become a skill the reader can use every day. These are actual skills, tools that people can walk around with and have with them when they need it. Q: Will reading Dangerous Instincts make people more fearful? A: Not at all. I think people will be mesmerized by what they learn from this book, and what they can take away from it. I am giving them a little behavioral toolbox in their back pocket to use everyday. Q: Will this book change people’s lives? A: I do believe that reading this book and using the skills the book recommends can definitely change a person’s life. When someone can do an assessment on an individual who is trying to come into their life—as a new friend, love interest, or hired help—and reach the conclusion about whether the person poses a danger to them, that is a real success.